Dr. Kevin Lenahan is a skilled optometrist who provides exceptional eye care services to everyone he meets. He has been working as an eye doctor since 1994, and is one of the most knowledgeable professionals you will find in the area. You can schedule an appointment with our optician, or stop by in the event of an emergency. Dr. Lenahan is a family eye doctor, so he takes patients of all ages. He explains every step of the procedures before starting so you are completely comfortable with the eye care you are receiving. For a doctor of optometry who provides a caring environment, look no further! We are affiliated with the American Optometric Association. Want to save some valuable time? Fill out your patient forms before you arrive. Click below to submit your patient information online! Click here to see yourself in thousands of different frames before you even set foot in our office! 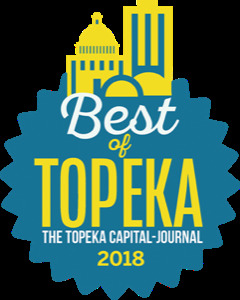 The Spectacle Wins Best Of Topeka 2018! The Spectacle - Dr. Kevin Lenahan O.D. Wins Best Eye Care In Topeka. Go check out the official site and all the other winners here. Big news! Dr. Kevin Lenahan has officially expanded his eye care services to the Emporia, Kansas area.